CCNA Cybersecurity Operations or CCNA Cyber Ops certificaiton is very recently introduced certification by the Cisco Systems. This certification is mainly focusing on skill development of Security Analyst who is working in a Security Operation Center (SOC). 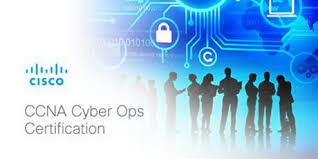 Cisco Networking Academy has launched the CCNA Cyber Ops 1.0 curricular for Netacad students. There are 13 chapters in the Netacad curricular to cover all the examiniation topics in 210-250 Understanding Cisco Cybersecurity Fundamentals (SECFND) and 210-255 Implementing Cisco Cybersecurity Operations (SECOPS) exams. CCNA Cyber Ops 1.0 curricular has reviewed by more than 300 Cisco Networking Academy Instructors. Out of very few CCNA Cyber Ops Instructor Trainers (Train the Trainer) globally, really proud to list in the first 10 Instructor Trainers in Asia Pacific and Japan (APJ) region and accredited as the first Sri Lankan Instructor Trainer as well.